A man of contradictions is the Biblical David–on the one hand revered as a warrior, poet, musician, king, and forefather of the Messiah, and on the other, scorned as an adulterer, liar, and sinner. What is it about this enigmatic character, already written about voluminously, that compelled David Wolpe to write this new biography, David: The Divided Heart? “I became fascinated by my namesake,” he says. David Wolpe is the rabbi at Sinai Temple, one of the largest Conservative synagogues in the Los Angeles area. He has written seven books and is often referred to as the number one pulpit rabbi in America. He is truly an impressive and generously welcoming man. In Hebrew David means “beloved,” and Wolpe explores how this meaning applies to his biblical namesake and delves more deeply into the Book of Samuel to give us a picture of the life of the man so exalted and loved. 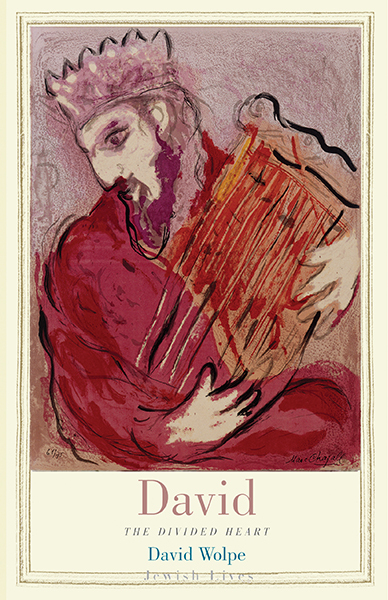 In simple but eloquent prose, Wolpe defines David’s multiple roles in separate chapters: youthful David, lover and husband, fugitive, king, sinner, father, and caretaker. He also includes David’s other roles as warrior, poet and Messianic forebear. Wolpe coalesces all these roles to give us a picture of a fully human character with tragic flaws, yet a man who was beloved by his wives, his people, and, most sincerely, by God. Wolpe begins by showing us “the sweetness in the portrait of the early David” as a simple shepherd and a poet. We see him become the beloved of Saul, while he soothes the brooding king. Of course we know later how love can turn to hate as the two vie for succession to the throne. But mainly Wolpe wants us to focus on the image of David after his anointing by Samuel. He is “touched by an inexplicable grace that the Bible calls the favor of God.” “God’s spirit has gripped him,” and from then on “he can betray, he can sin and stumble, but he cannot fail.” So no matter what his human failures might be in whatever circumstance he encounters, David retains God’s favor because of his everlasting faith. Wolpe opens for us a way of looking at David that reveals more of his character. He shows us how David’s relationships with women are just as complex as he is. While women play a powerful role in his life–loving him, advising him and offering him comfort–David never expresses love for them. “We know,” says Wolpe, “that David is capable of using those around him for his own ends.” So while he profits from marrying Michal and Abigail, he keeps them at a distance, seeing that obligations to them might alter the course of his destiny. His heart is divided between his wives and children and others who would lead him to greatness. Even as he calls for the return of his son Absalom he cannot face him. He is so distant with Absalom during the feigned reconciliation, Wolpe tell us, that “it is not anger, which implies intimacy, but the cold, cloaked dissociation of a man whose heart is unavailable to himself, and therefore to his child.” Perhaps this failure is due to his neither being loved by his father nor his brothers, but it is a character trait that carries through all his relationships. David’s fall begins with the saga of Bathsheba. We all know the story: David’s lust for her is his downfall, and his ruthlessness ensures her husband’s death. So now he has committed two sins: adultery and murder. He grieves because of his sinning and for the child of his adultery who will die as his punishment. Yet he finally shows empathy for Bathsheba, lying with her to conceive their son Solomon, heir to the throne. Because David is such a fully realized human being, we can personally relate to his story. Even today we see how lust brings about the downfall of powerful leaders; we watch men pitting their wits against each other to see who will rise to greatness. David’s legacy is that the more human we are, the closer we come to God. Linda Tucker is a freelance writer on Jewish topics. David committed first degree murder with the killing of Bathsheba’s husband. Rabbi Wolpe defends “the stubborn integrity of the divided heart”…fancy words that justify profound criminality; an ugly story. Your comment saddens me. Of course there’s one entity that can give life…or take it, without justification, Jehovah. The spirit of that baby, indeed all spirits, are the spirit children of Elohim. Isaiah tells us that. David has been an enigma to me for a long time. Thats why I’m looking forward to reading Rabbi Wolpe’s interpretation. As I read David’s life, he was favored of Jehovah, but lost his exhalation by his sinfulness. I hope for clarity. And good fortune to you in your journey, Chayim.